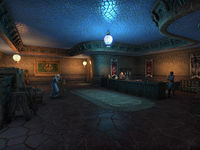 Tanners and Miners Hall is the outfitter located in Vivec City. It is located within the Saint Olms Waistworks, in the southeast corner. This page was last modified on 8 July 2018, at 09:25.